With Wednesday as a current exception, afternoon and evening thunderstorms will remain a possibility at least until Thursday. Sunday and Monday's high temperatures in Kiowa County will continue to be in the mid- to upper 80s before jumping to the low to mid-90s during the middle of the week. Current forecasts call for a return to mid-80s Friday and Saturday. Overnight lows are expected to be in the 60s throughout the week. As monsoon moisture remains in the area, Sunday will be mostly cloudy before potential afternoon and evening thunderstorms set in. Flash flooding, wind gusts from 40 to 50 miles per hour and small hail are possibilities. A slight chance of thunderstorms remains for Monday, Tuesday and Thursday as upper level high pressure builds over the region. 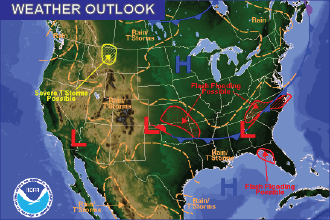 Moisture from a tropical depression crossing into the Pacific will join the flow into Colorado around midweek, potentially bringing more precipitation to western Colorado and the central mountains, and later to the eastern plains.